Draco Malfoy: I hate that Harry Potter! HARRY? YOU BROUGHT A HARRY TO HOGWARTS?! That Harry Potter is bad he even said the elder swear. Don't be naughty with that elder swear now it's bad so don't misuse it. Or don't use it. My week sucked but least this makes me smile. Here's both Harry Potter Puppet Pals for The Mysterious Ticking Noise, and The Wizard Swears. Also yes I am probably like Neville Longbottom proud of it. Do my ears detect foul-mouthed ness on Spyroforum? 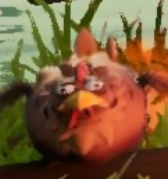 is that one of the Beast Maker chickens? Misty Bog. It's wonderfully derpy. that's pretty wonderful. i always love the chickens in the Beast Makers levels. they're just... they're just wonderful. That's an ugly chicken? Oh wait I know what to have for dinner. there's always that guy behind the starting point of Misty Bog who captures a chicken. i'm sure he wouldn't mind splitting the chicken with us! you know, every time i freed that chicken, i wished it would move around but it always just sat there where the cage had been. Chicken for dinner dig in. Not the ugly one.